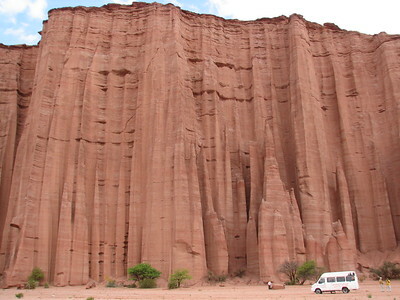 The Ischigualasto and Talampaya Natural Parks were established to protect geological formations of the Triassic Period. They are rich in diversity of both plant and vertebrate fossils. The parks are contiguous and belong to the same geological formation, though divided between two Argentinian provinces. The Triassic Period (popularly known as the Age of the Dinosaurs) lasted from 245 to 208 million years B.P. Some of the oldest known dinosaur remains were found in this location, which makes it one of the most important palaeontological sites in the world. Also, geologically, it is the only place in the world where a complete sequence of continental sediments with abundant fossil fauna and flora for the Triassic Period can be seen. The red sandstones of Talampaya are the earliest. The Ischigualasto Formation is composed of white floodplain sediments and is immensely rich in fossil specimens of reptiles, amphibians, therapsids and plants. The desert vegetation of the parks is sparse and consists mainly of shrubs and cactus. While it was 40 degrees Celsius the day before in La Rioja, it even rained on the Saturday I set out to visit Ischigualasto and Talampaya Parks. At the park entrance of Ischigualasto we were told that parts of the park were sealed off for visiting today because of flooding. Fortunately we could get in to a significant part. Visiting here is regulated by driving in a convoi, assisted by a park guide. This park sees about 150 to 200 visitors a day, and is more commonly known as Valle de Luna. There were 5 other cars in our group. The guide signed for stops, which included short walks and explanatory talks. Right at the beginning are rocks that perfectly show the thousands of layers of sediments that have been left here by geological processes. The area used to have a tropical climate with abundant flora and fauna, but is now strictly desert. Fossils of plants are still in situ and are clearly distinguishable. The remainder of the 2,5 hour tour takes unpaved roads through the often strangely shaped desolate landscape. One of the most remarkable is de cancha de bochas, like a bowling court where the balls have been shaped by water en wind. The entrance to Talampaya Park, although contiguous with Ischigualasto, is 80 kilometers away. Tours here are by guided mini bus tours only, for which you can arrange at the gate. The route here covers a spectacular drive on the dry riverbed right through the canyon, which red sandstone walls climb up to 150 meters. The rivers in this region are dry all over, a little bit of rain like of today doesn't change that. One of the canyon walls is shaped in a half circle, and makes a great echo (echoed several times over in the canyon). There's also a stop at several collections of petroglyphs. They were made by the people that lived here between 120 and 1180. The glyphs often show guanacos - a member of the camel family like the lama and vicuña, which still can be seen roaming around both these parks. The only other animal we saw sprinting away was a large hare. Finally, photo stops are arranged to try to capture the geomorphology (a cathedral, a tortoise, a tower, a totem). This is a strangely tricky WHS to visit - it is located quite far from everything. I wasted a day in the city of La Rioja, where the highlight of my stay was a visit to the local Carrefour supermarkt. It had great airconditioning and lots of tasty snacks. For the fast traveller, I think it would be best to arrive at La Rioja bus station early in the morning, ask around there to find a remiss that will take you around to the parks for a fixed fee, and leave for your next destination (Salta and Cordoba are easily within reach) the same evening on a night bus. A tour from La Rioja to both parks takes at least 12 hours. There's no public transport directly to the entrances of the parks (you could try to hitchhike from the nearest towns). I'd never heard of this WHS until looking at the list just before entering Argentina. It wouldn't have made my itinerary either if not for Michael Novins' detailed review on how to get to Talampaya by public transport. Suddenly it seemed like a very doable stop between Mendoza and Jujuy and we are glad we made the effort. From Mendoza we took a bus to the tiny town of Patquia, planning to catch the Facundo bus on its way from La Rioja and saving us an hour of sleep and backtracking. What we got for our troubles was standing room on a very crowded and hot bus. It was running late but we easily had enough time for a tour before catching the return bus at 4pm (also running late). Entry fee and tour fees were a little high considering that this is not a popular or busy site with foreign or even domestic tourists as far as we could tell. We were easily able to pick whatever tour we wanted. There were options for short walking tours and driving ones. At 40 degrees we weren't going to walk any more than necessary. We ended up in a van. It seemed to be the most common option and the one that worked best with our timing. There is no choice but the set 4 stops or a slightly longer tour with a 5th stop in another narrower canyon. The 5th stop was actually quite nice and the group walks about 500 meters inside the canyon. Squawking parrots flying through overhead was a nice effect. As for the rest of the standard tour, it felt like it went by quickly and you need to really love rock formations and hard to see petroglyphs to get much out of it. It reminded me of childhood road trips in the national parks of the southwest USA and I enjoyed the nostalgia. There isn't much mention of dinosaurs but I guess that is more on the Ischigualasto side which is still not accessible by bus as far as I could tell. We easily made it back to La Rioja in time to catch the latest overnight onward buses so it is possible if you want to minimize time in the area. Unfortunately they were all sold out and we got stuck in town for the night anyway. It felt like our most off the beaten path part of Argentina. In October 2017 I visited Talampaya National Park by public transport from La Rioja, which is much easier than I was led to believe by the information I read on various websites. I took the 7:00 am bus operated by Facundo from La Rioja, destination Villa Unión, which travels through Talampaya National Park. Around three hours from La Rioja, the bus passes the park's main entrance, where the bus will stop upon request (I was the only passenger to disembark at the park, so don't rely on others to request the stop). The bus arrived at the main entrance just after 10:00 am. From the highway stop, it's a few minute walk to the administration building (restaurant, tours, restroom, etc.). I canvassed the various tours, but all of the vehicular tours of the park are essentially the same and make the same four stops (petroglyphs, a shaded area with a variety of plants, and two different areas known for sandstone formations). The only decision was whether to take a minibus, overland truck or full-size bus. I opted for the overland truck since passengers are allowed to ride in seats bolted to its roof, allowing a 360° view, but all of the vehicles follow the same route, so it hardly matters. The tours follow a dry riverbed through a vertiginous red sandstone canyon searching for 1500-year old petroglyphs (several), wildlife (not much) and unusual stone formations (plenty), some of which are enormous. The tours last about three hours. I took the noon tour, which ended at 3:00 pm, so I would have plenty of time to eat and walk to the highway to flag down the bus as it returned from Villa Unión and passed the park's entrance just after 4:00 pm. 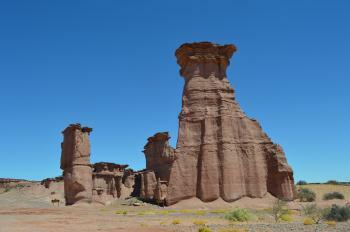 Ischigualasto National Park is one of the secrets of Argentina. Barely mentioned and hard to access, it’s rarely on the itinerary of the average traveller. It is worth the effort, though. The moonscapes turn into stunning valleys. Rocky outcrops named for the shapes they resemble (the sphinx, the submarine…) appear seemingly from nowhere. In the rocks, hidden from view for millions of years, are the remains of dinosaurs. Many have been discovered and moved for scientific research. Undoubtedly many more remain beneath our feet. The rocks are up to 240 million years old – and this is the world’s most complete fossil record of the Triassic Era. Nowhere else on the planet reveals so much about the evolution of vertebrate life. I visited these parks in January 2003. I went first to the little town of Pagancillo. I could find neither package trips nor any form of public transport to the site but a local resident, Aldo, was happy to taxi me around in his pick-up truck, and at a very reasonable price too. 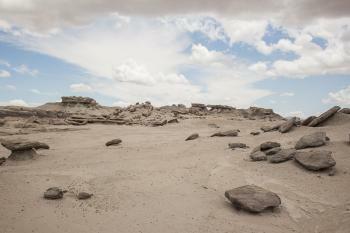 We visited Ischigualasto first, Aldo advised that the light was better earlier in the day. Here visitors' vehicles are organised into a convoy and then led around the site by a Park Guide. Frequent stops are made and things of interest pointed out and explained. Although this was said to be the rainy season there was very little substantial vegetation, it's a semi-desert, in parts rather like the Badlands of Dakota but perhaps not as colourful. There are some remarkable and highly dangerous looking columns where a hard rock capstone protects and is supported by a tapering towards the bottom pillar of softer rock. There is a feature known as The Ball Court where large, almost perfectly spherical stones have been formed by windblown sand sticking to an inner core. While Ischigualasto is perhaps of most interest to those with a serious interest in geology, Talampaya is more picturesque. Here the park rangers provide the transport and in about 3 hours will show the visitor petroglyphs cut to exploit a remarkable blue deposit on reddish brown rocks; guanacos and a variety of birdlife; an excellent echo, got by shouting into a canyon and some (20m?) sandstone columns as sharply cut as anything I've seen made of basalt.